SAN FRANCISCO (February 12, 2016) – Dolby Laboratories, Inc. (NYSE: DLB) today announced that Disney, Lionsgate, and Twentieth Century Fox will release four live-action and animated feature films for Dolby Cinema around the world. Featuring Dolby Vision and Dolby Atmos, Dolby Cinema is a premium cinema offering for exhibitors and moviegoers that combines spectacular image and sound technologies with inspired design to make every visit a completely captivating cinematic event. The first of the new titles joining the Dolby Cinema slate will be Twentieth Century Fox’s “Deadpool”, in theatres February 12, 2016. Additional titles scheduled to deliver audiences the total cinema experience include Disney’s “Zootopia”, in theatres March 4, 2016; Lionsgate’s “The Divergent Series: Allegiant”, in theatres March 18, 2016; and Lionsgate’s “Now You See Me 2”, in theatres June 10, 2016. Following the successful Academy Award nominated Dolby Cinema titles “The Revenant” and “The Martian”, Twentieth Century Fox returns with “Deadpool”. In the movie, a former Special Forces operative turned mercenary is subjected to a rogue experiment that leaves him with accelerated healing powers, and he adopts the alter ego of Deadpool. Lionsgate’s “The Divergent Series: Allegiant” continues the science-fiction dystopian saga, with Tris and Four venturing into the world beyond the wall, where they are taken into protective custody by a mysterious agency known as the Bureau of Genetic Welfare. In Lionsgate’s “Now You See Me 2”, the Four Horsemen return. One year after outwitting the FBI and winning the public’s adulation with their Robin Hood-style magic spectacles, the team resurfaces for a comeback performance in hopes of exposing the unethical practices of a tech magnate. In addition to Disney’s previously announced live-action film “The Jungle Book”, due out April 15, 2016,the Walt Disney Animation Studios feature “Zootopia” will be released for Dolby Cinema. The modern mammal metropolis of Zootopia is a melting pot where animals from every environment live together—where no matter what you are, from the biggest elephant to the smallest shrew, you can be anything. But being the first bunny on a police force of big, tough animals isn’t so easy, so Officer Judy Hopps jumps at the opportunity to crack a case, even if it means partnering with a fast-talking, scam-artist fox, Nick Wilde, to solve the mystery. Dolby Cinema begins with the filmmaker’s vision—using the full storytelling capabilities that Dolby offers in image and sound production to transform the way movies are made. Combined with state-of-the-art image, sound, and acoustic capabilities, every visit to the theatre is a completely captivating cinematic event. Dolby Cinema also includes the Dolby Atmos sound technology, which moves audio around the theatre, even overhead, with amazing richness and depth. The combination of Dolby technologies with the design and comfort of the Dolby Cinema will make audiences feel closer to the onscreen action than ever before. Dolby Cinema includes award-winning technologies Dolby Vision and Dolby Atmos. Dolby Vision is a state-of-the-art authoring and playback imaging technology that enables the cinema to bring the story alive onscreen. In 2015, the Dolby Vision laser projector received an engineering excellence award from the Hollywood Post Alliance. Outfitted with DolbyAtmos, a Dolby Cinema transports audiences into the movie with breathtakingly real sound that fills the cinema and flows all around them. Dolby Atmos has received technical achievement awards from both the Hollywood Post Alliance and the Cinema Audio Society. When these technologies are combined with the sophisticated Dolby Cinema design, everything comes together to pull moviegoers more deeply into the story and transform their visit into an event. 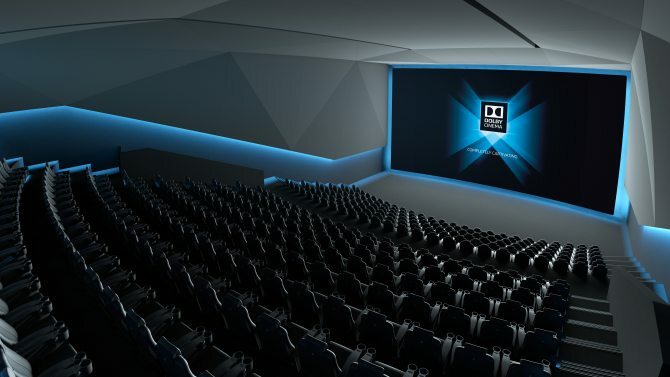 In just over a year, more than 200 Dolby Cinema sites have been installed or committed to across the globe, with 22 titles released or announced.